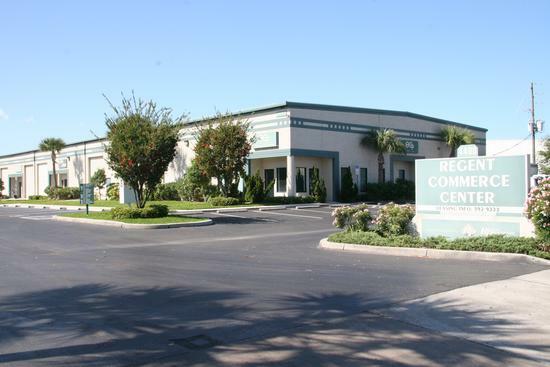 Located in the center of Pinellas County, the Regent Commerce Center is a beautifully developed and maintained industrial park housing a mixture of distribution, manufacturing and service type businesses. The attractive landscaping coupled with the well-maintained concrete block buildings and parking areas provide a pleasing appearance not commonly associated with standard industrial parks. The 20 ft high concrete block buildings provide ample space utilization with safe and secure features. This park contains unit ranging from 2,000sf up to 50,000sf. Each unit has a minimum of one 12’ x 14’ grade level roll-up door with several units also containing truck-wells. Located on a major thoroughfare, 118th Avenue North allows for easy access and high visibility. Just east of 49th St. North, minutes from I-275 (access to Tampa and St. Petersburg), U.S. 19, and both the Tampa International Airport and the St. Petersburg/Clearwater International Airport.